Virtuoso mandolin, sensational songs, hot swing fiddle and huge lashings of fun from Britain’s leading ‘hot-fingered mandolin virtuoso’ Simon Mayor, and silver-voiced songstress Hilary James. It’s probably the diversity of their repertoire that surprises people most: from folk songs to Berlioz, blues, classical mandolin show-stoppers, swing fiddle, and maybe a couple of their own infamous comic songs. Oh, and Hilary might even manage a step dance if the wind’s in the right direction! Just recently their shows have enjoyed some added literary spice with a pre-concert film and poetic excursions from their new book Of Death And A Banana Skin. Pepper it all with Simon’s unique brand of off-beat humour and Hilary’s honey-dripping voice for a massively entertaining evening not to be missed. Serious stuff – but don’t take it too seriously! 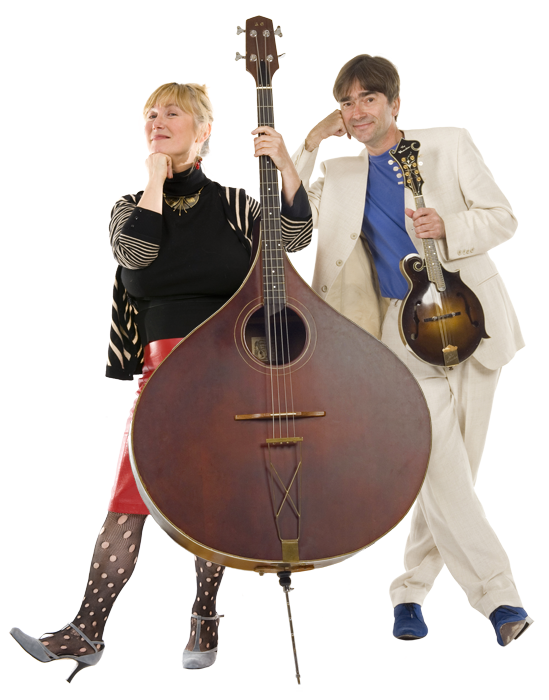 Here are some samples of live humour taken from Simon Mayor & Hilary James shows or with their quartet The Mandolinquents. (all voices and instruments – Simon Mayor & Hilary James.